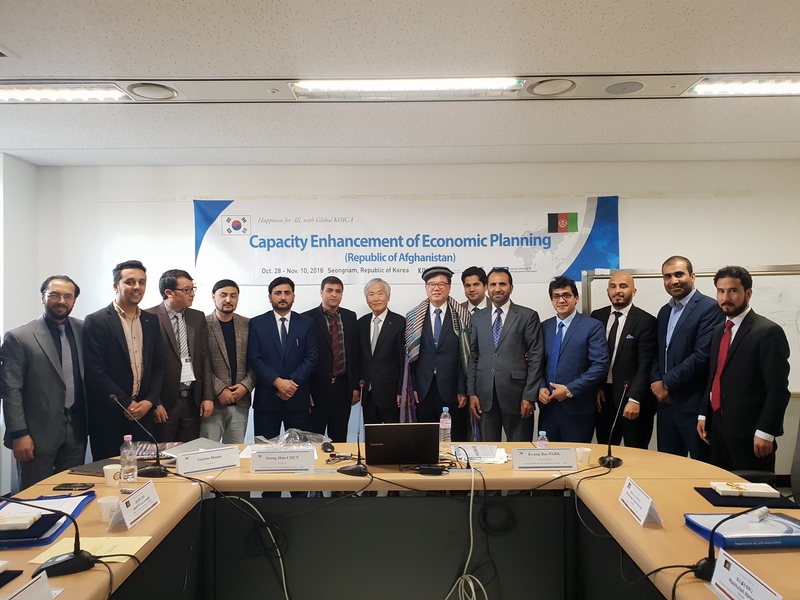 The Korea Institute for Development Strategy (KDS) has successfully conducted the 'Capacity Enhancement of Economic Planning' for government officials of Afghanistan from October 28th to November 9th, which is part of KOICA's Capacity Building Improvement and Advancement for Tomorrow (CIAT) Program with the purpose to enhance capacities of public officials from developing countries. The delegation of the first-year was composed by 12 public officials from the Ministry of Economy and Ministry of Finance of Afghanistan. The main topics for this training program were National Development and Policy Management System; Effective Management Mechanism for National Development Policy Institution; Effective Mobilization of Resources and Project Management; and Understanding of Korean culture. For the program, experts with real work experience on Korea’s Economic Development participated to deliver the lectures as Dr. Seung Hun Chun, President of KDS; Moon Kyu Bang, Former Vice Minister of the Ministry of Finance and Economy; and Dae Yong Choi Former Senior Executive Official from the Ministry of Strategy and Finance. Moreover, the participants visited the Ministry of Patriots and Veterans Affairs and Industrial Sites such as Hyundai Motors, Hyundai Heavy Industries, POSCO Pohang Steelworks and Samsung Innovation Museum to have a better understanding on Korea’s economic development. Based on the knowledge and experience acquired during the training program, the delegation formulated 3 Action Plans with the following topics: Mechanism for Prioritization of Development Projects, Strengthen Economic Development Planning at Provincial Level and Establishing a Mechanism for developing provincial socio and economic profile. During the presentation of the Action Plans, Dr. Chun had provided essential and realistic advice and feedback. The next training program is expected to be held during October, 2019.